In Safe Hands is a Safety Management System designed for community groups in practical conservation. 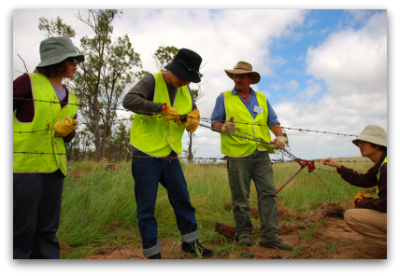 The content and processes have been adapted from Conservation Volunteers Australia’s own system and is based on our 30 years of knowledge and experience in managing volunteers in practical conservation. Recent enhancements and access to this toolkit and workshop opportunities for Landcare and other community Groups has been made possible through funding from the Australian Government’s Caring for our Country initiative. You can either download the manual or participate in some free training and learn more about how to safely manage yourself and other volunteers on your Landcare or Bushcare site. All Groups who wish to use the manual must register their details, via the registration process below, to receive the In Safe Hands Toolkit, workshop updates, content updates and support. Registrations will be open until June 30 2013. Training workshops will be offered under the Caring for our Country project in select locations across the country from February to July 2013. Visit this page for details and updates. A training DVD will also be available in 2013. To book: All bookings are to be done online via the Conservation Volunteers Website. Click Here. If you are unable to attend the workshop, you can also download the manual by registering your group.